Anyone paying attention over the past few years has recognized Dana Point’s financials showing a clear trend of operating and capital spending rapidly outpacing revenue. When this trend continues over time, savings rapidly erode. The City now acknowledges the roughly $2,000,000 structural deficit projected for 2020. I thought, hey, let’s gather a small group of financially competent people around a table and let them comb through the city’s financials. As Council member Viczorek likes to say, find the waste, fraud and abuse. Hence the name, the Financial Review Committee (FRC). Numbers are not political. I was naïve. People are. Here are examples. (Former FRC) Member Nelson reviewed 10 years’ worth of the city’s comprehensive annual financial reports showing financial decline. By a 3-2 vote, FRC recommended not to present it to Council. The FRC should have jumped all over this. Council needs to hear this now! Undaunted, Member Nelson gave her report to Council anyway. The city now projects a nearly $2,000,000 structural operating deficit by 2020. Committee Member Hill continually requests items be put on the agenda, but those items do not appear. During the last meeting, Member Hill brought up a subject and staff interrupted Member Hill and said why the matter should not be discussed. The chair allowed this to Member Hill’s frustration. Now, FRC’s latest 3-2 vote, this time against in-house legal counsel. The city’s 44-page report was not neutral. Its unsubstantiated assumptions tilted heavily against hiring an in-house lawyer. It read, “Risk management can easily get lost in the discussion because personalities and costs are easier to grasp…name law firm may be more effective…than one from in-house counsel…This is just my view, but again I feel compelled to share it.” No facts supported this undisguised, unsubstantiated advocacy. The report’s exclusion of “Strands Gate” is misleading if a basis of opposition is “a name law firm may be more effective…than one from in-house counsel.” The City’s six-year lawsuit against the Coastal Commission handled by a “name firm” ended in a judge’s written decision calling Dana Point’s emergency ordinance “theater” and a “pretext,” and payments to Surfrider Foundation and Ocean Institute of $150,000 and $300,000 respectively, plus Dana Point’s own legal fees. The City Attorney spoke extensively on his firm’s excellent performance over the years. No in-house lawyer was invited to speak. 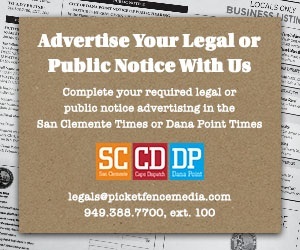 Members mused “Dana Point contracts for fire and police, why hire in-house attorney? These cities must know something we don’t know.” When a member was troubled that Rutan’s contract hasn’t been bid since 2002, Member Hill said I proposed that to Council. It lost in a 3-2 vote. The FRC’s decision predictably mirrored Muller, Viczorek’s and Tomlinson’s previous “NO” votes to going in-house. Carefully read, the report ultimately proves Dana Point pays more per hour for lawyers than almost every other city and that it is more cost effective to hire in house. Facing a looming deficit, we could try to achieve substantial savings. We must reject, business as usual.